Join The ID´s Military, become The Universal Soldier ! Support for World Safety & Peace ! We are Stand for support Security of Africa, ID's Military Service Primary Monthly Payment 3,000€. SECOND SERVICE, Military operation's according Geneva Convention's, UN Charter and UN General Assembly Treaties, Multilateral Treaties between Legal States. Identity Protection, or New Identity can be provided, together with protection from foreign police investigation's and judicial trial's. 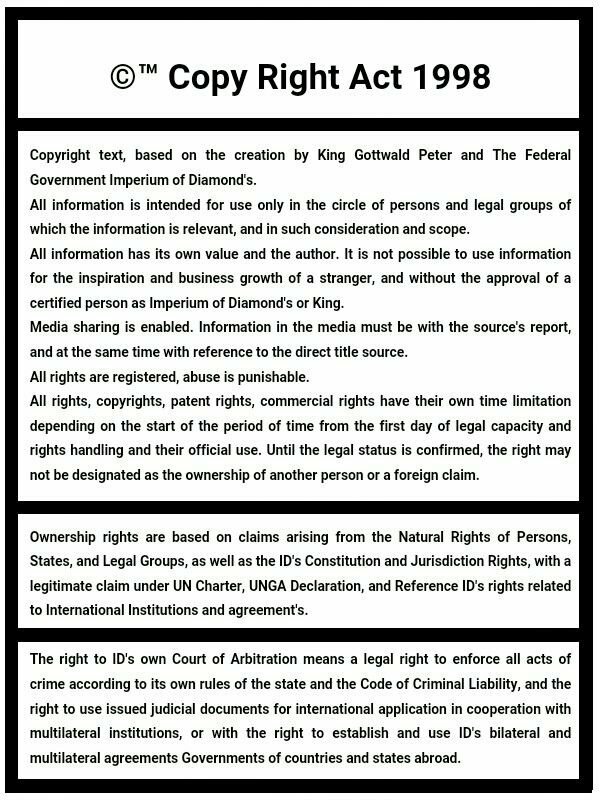 Law of War, International Law, International Economy Law, International Political Management and Diplomacy, ID's State Codes, Operation of War Conduct in Praxes, Management of Business. Special Health Control and Care, available long life condition for more than 1,000 year's. ID's Citizenship (10,000,000,000,000 € value in DMD monthly claim of payment) guaranted ! 1) The ID's Global Security Concern of Private Companies Inc. have own code established in purpose which allow PMSC's adoptation of Office, or Supranational Organization's can Observe, Supervisory, and Manage the Office with ID's GSCPC Operation's and Logistic's, The African Union can deploy own Policoes or Contracted Manager's who are use meta-legal position for the activation of the ID's GSCPC Industries and therefore ID's GSCPC Industries as Institution internal economy, sponsore the operation's by the Private Security Companies around the world, the companies who are contract the partnership in agreement on the ID's GSCPC. World Geography of PMSC, is 2,500,000 soldier's which can employ High-Tech Military Technologies provided by the ID's GSCPC Industries, and 10,000,000 Civil Security Agent's who are can protect civil areas during conflict, Africa continent is originally a country of 700,000,000 man's who are have physical capability for military service and value of profit on ID's GSCPC service can prevent people interest in economic migration into foreign countries, when also effective in small percent states economies also increase. 2) The ID's Global Independent People, is network consist Independence Movement's, Civil Communities, bud also Resistance Armies and Armed Movement's which claim resistance agains't legal government policies, the ID's GIPF project is intelligence developed for recruitment by the inspiration in greater success per faster time, if the Resistance finish and movement is transform on Civil Protection Unit, with Parliamentary Political Party Diplomacy according purpose to build the One World Coalition of Political Parties, under statistic of praxe analysis is better success stand as member of government and obtain opportunity control whole country as national leader, than lose life in forest and deserts as resistance movement, all people of Resistance member's can only accept partnership if African Union support opening ID's Provisory Administration & Communication Contact Center by contracting of Private Lawyer's and Business Manager's, we are want stand as International Leader and partner for every nation, we are also can therefore provide around 2,000,000 soldier's power by today world capacity of standardized resistance soldier's. 3) If African Union states support function of the ID's Provisory Administration & Communication Contact Center, ID's Government can provide project for activation of AU Continental Security Industry by centralization of African Industrial Commerce, which allow building militaries of 1,000,000,000 Autonomy Soldier's with High-Quality in Military Operation, and can protect whole African continent, decriminalize in less than week. Organizing Multilateral Peacekeeping Unit's haven't dispute in Geneva Covenant's on Provisory Office in hosting neutral states. - Mean interest of The ID's Military Activities is Office Intelligence, Legal Affair's & Political strategy organization, Technology & Science development, fight mean protect the life of soldier, corporate member and every one a One Company.